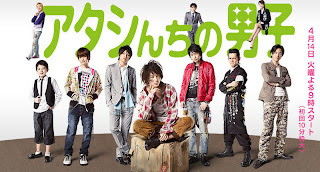 Tagline: Kazoku Ijo, Koibito Miman!? These days, the term "homeless" has taken on new meaning. There are youths referred to as "net cafe refugees," who have neither a job nor a place to live, but who find themselves hopping around internet cafes. One such refugee is a 20-year-old girl named Chisato, who lost her mother at a young age due to sickness. She spent her youth trying to escape from the huge debt her father left her, and her battle with the repossessors unfolded every night. However, her life changed after meeting one man named Shinzo, changing her views on the meaning of "family." Shinzo comes from a rich family tracing back to the Edo period, and he adopted six good-looking sons with the hope of one becoming his successor, but all of them have strange personalities. Shinzo promises to free Chisato from her debt if she marries him and becomes the mother of his sons. However, a life with these six guys under one roof will not go smoothly.